A lot of work! I tried to be very precise with my points and the way the seams were going. Maybe some straight line quilting in the ditch around the diamonds? They'll finish like big Xs. Love this! 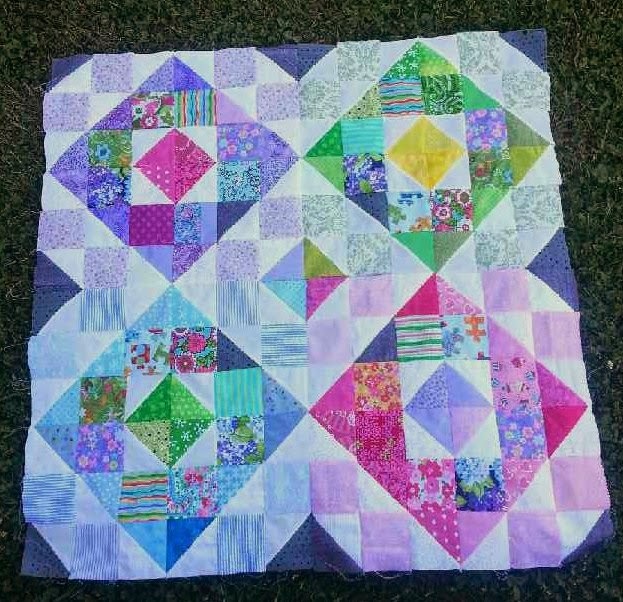 KarrieLyne hosted an awesome quilt-along and has a PDF of the project. Linking up with Rainbow Challenge 2014- the friendliest Linky party going! Beautiful block! Your extra patience paid off for sure, your block looks nice and flat with beautiful points too. Congratulations! Very pretty! Love the soft colors in all the blocks. It definitely says "Spring" to me. I downloaded this pattern, but haven't tried it yet. I like the way you separated the colors. It gives it a different look than the original. That is gorgeous! I need to follow the link and grab the pattern. Very pretty. Lovely top, and how exciting on the eggs! What a lovely top! I prefer your version to the original. As Gina said, the pattern is more visible in yours and it looks great. What a treasure to have those little birds lay an egg for you. It will be fun watching to see what develops.